Note the Alignment! 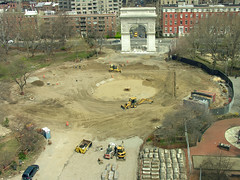 This photo illustrates the circle (in center) of where New York City intends to place the newly aligned fountain. One of the contentious issues of the “renovation” of Washington Square Park is the movement of the fountain 22-23 feet east to be “aligned” with the Arch at Fifth Avenue. I imagine Mayor Bloomberg, Parks Commissioner Benepe and “Architect” George Vellonakis sipping champagne somewhere ecstatic that, with the realization of their “vision,” the famous Washington Square Park Fountain and the historic Arch will AT LAST be aligned. No matter that it worked just fine for over a century as it was. The redesign of Washington Square Park is about taking apart the pieces of this great public space that functioned incredibly well for years and years and tampering with them. In a business model – which CEO Mayor Bloomberg knows – if something works well, you try to make it better, but you don’t change it dramatically. Of course, it’s not about that. It’s about creating a new business model – for Washington Square Park. Imagine sitting at the Fountain (well, if you can, once it has a 45 foot plume spouting up from it) and think how glad you will be to view so clearly the traffic careening down Fifth Avenue. New York City government’s attempt to create symmetrical spaces (4 “plazas” at each corner, lush manicured lawns and planters in the proper places) in a public space that’s always been about not being symmetrical misses the whole point (purposefully). Note: Since this photo was taken, there is a big hole now dug in this center spot. It’s a bit sad. The thing is … they may get their Tisch fountain aligned with the Arch, but — as far as the entire redesign plan being replicated — let’s see what transpires. As they say, it’s not over til it’s over.